The TUCO (Trinbago Unified Calypsonians Organization) Sports and Family Day took place on the cool evening of Sunday 5th November, 2006 on the open fields of the Queen’s Park Savannah. 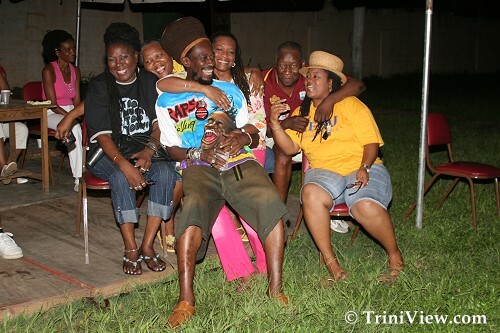 Although many top celebrities in the Calypso fraternity were present, they were there among families and friends to enjoy an evening of fun and relaxation instead of performing at a major concert. More and more people started to assemble at the venue at about half past three in the afternoon after some midday showers and a disappointing cricket match between the West Indies and Australia. Despite the loss of the West Indies team, this did not put a damper on the family lime. As the evening progressed, those gathered engaged in several activities including some card playing, games of checkers and one of the highlights of the evening, a cricket match between the National Flour Mills (NFM) and Kaisoca cricket teams. Although the NFM team won the match, there were no signs of antagonism among the players. Throughout the evening music was provided by DJ Dale ‘Cutting Crew’ Cutting who was supported by his friends, Elwin ‘Daddy Scratch’ Edwards and Richard ‘The Specialist’ Adams for the entire programme. DJ Cutting Crew was also responsible for requesting music CD’s from the artistes so that their songs could have been played. The last activity on the programme was live performances by the artistes. The artistes who performed on this fun-filled night are as follows: Trevor ‘Trevy’ Warner, Clyde ‘Clydee’ Pierre, Jalani Kojo, Nefta Kojo, Terry ‘Brother Rap’ Alleyne, Akil ‘Brother Akil’ Ayodele, Morrel ‘Luta’ Peters, Cuthbert ‘Typher’ Blackett, Yafeu ‘Rootsman’ Osei , Daniel ‘Trinidad Rio’ Brown, Ann Marie ‘Twiggy’ Parks-Kojo, Kenson ‘Ninja’ Neptune, Lutalo ‘Brother Resistance’ Masimba, Karega Mandela, Edwin ‘Crazy’ Ayong and local group Smoothe Kremnalz featuring Dillon ‘Face’ Bertrand, Stephen ‘Stevie’ Daniel and Richard ‘Kyat’ Pereira. The TUCO Sports and Family Day ended several minutes after nine that night and many looked forward to other socializing events with their peers within the Calypso arena.